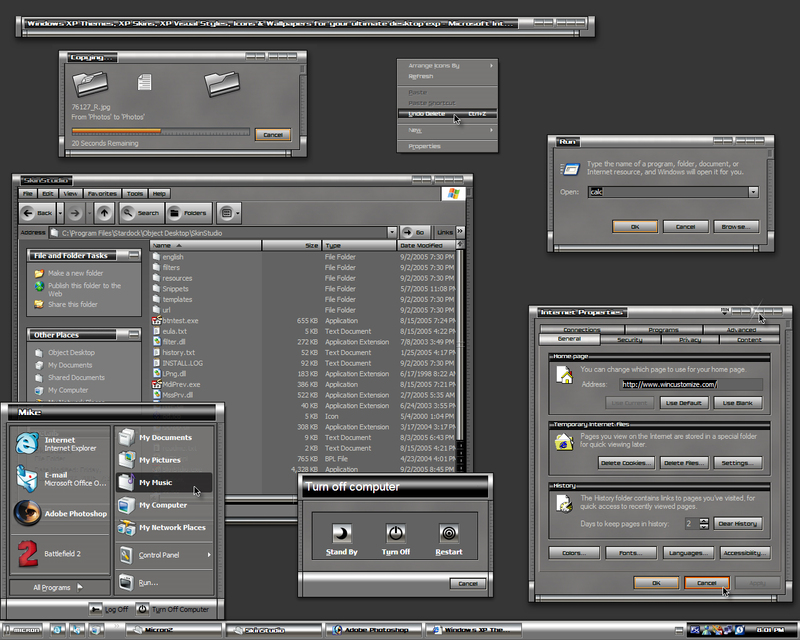 Updated for WindowBlinds 4.6 by Mike Bryant, with kind permission from Dangeruss. Last, but not least, Micron2 is the final update of the Dangeruss Project. It now supports the latest WindowBlinds features, including titlebar button and start button mouseover effects, transparent start menu, toolbar icons, progress animations, and more. Thank you so much! Micron2 was/is my favorite WB skin of all time. Mike, and Dangeruss, you two are truly artists, and a real asset to the skinning community. For those of us artistically impaired people you are a drink of cool water in the desert! One of the best of Russ's art collection. Thank you very much to both, Russ and Mike. I did say quite a while ago to Mike while Russ does 3D rendering these days what it be like in todays themeing what sort of style Dangeruss could pull off now. Probably interface design to him would be a doddle now since he makes insane 3D work. Bulky and shiny - some would consider that a "typical WB skin" and they wouldn't mean that as a compliment. I believe that such an incredible amount of work and talent could be much better spent. I don't like it, sorry:(. Another great update to a classic skin.Thanks alot, Mike, you've done an excellent job on each and every update. I never got to tell you this and I hope you see this late comment, I just put this on today and it is so beautiful. I don't know why I never used it before, but it was in my WindowBlinds whiich is still 4.6. Not because I am too cheap to upload a new version. It is just that it is working so well and newer versions I have trouble with. I have XP and this is just so perfect, especially on Firefox. I keep my subscription to windowblinds every year and the old ones are the best and they are free. The new one's screw up my computer and a lot are not as good as the old one's. I just hope you see this comment sometime if you ever come back. I am now going to make sure I have the rest of your updates. Thanks Mike for the great work. Darlene aka Darco PS Today is January 30, 2010 Happy New Year!! !